Meet the newest blondetourage: COLOURING.ANGELS. Four new colour-enhancing treatments add a lip-gloss like shine and tone to the hair to enhance existing tones, neutralise unwanted tones, and improve colour longevity without building up on the hair. Packed with hair-loving ingredients such as Olive Leaf Extract, Green Tea Extract, and Grape Seed Oil, these newest ANGELS moisturise your hair while improving flexibility and adding protection for your locks. Kevin Murphy newest BLONDE squad includes four colour enhancing shades - AUTUMN, COOL, CRYSTAL, and SUGARED - to add subtle hints of colour and incredible, illuminating shine. Kevin Murphy Colouring.Angels (Autumn.Angel)A family of four colour enhancing treatments. Designed to improve the condition of all hair types, impart a lustrous shine and offer a range of tonal solutions. The pigments have been selected to enhance existing tones, neutralise unwanted tones and improve colour longevity without building up on the hair.Size: 250 ml & 1 LitreFeatures & Benefits..
Kevin Murphy Colouring.Angels (Cool.Angel)A family of four colour enhancing treatments. Designed to improve the condition of all hair types, impart a lustrous shine and offer a range of tonal solutions. 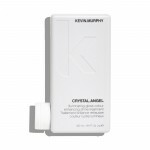 The pigments have been selected to enhance existing tones, neutralise unwanted tones and improve colour longevity without building up on the hair.Size: 250 ml & 1 LitreFeatures & Benefits: ..
Kevin Murphy Colouring.Angels (Crystal.Angel)A family of four colour enhancing treatments. Designed to improve the condition of all hair types, impart a lustrous shine and offer a range of tonal solutions. The pigments have been selected to enhance existing tones, neutralise unwanted tones and improve colour longevity without building up on the hair.Size: 250 ml & 1 LitreFeatures & Benefit..
Kevin Murphy Colouring.Angels (Sugared.Angel)A family of four colour enhancing treatments. Designed to improve the condition of all hair types, impart a lustrous shine and offer a range of tonal solutions. The pigments have been selected to enhance existing tones, neutralise unwanted tones and improve colour longevity without building up on the hair.Size: 250 ml & 1 LitreFeatures & Benefit..